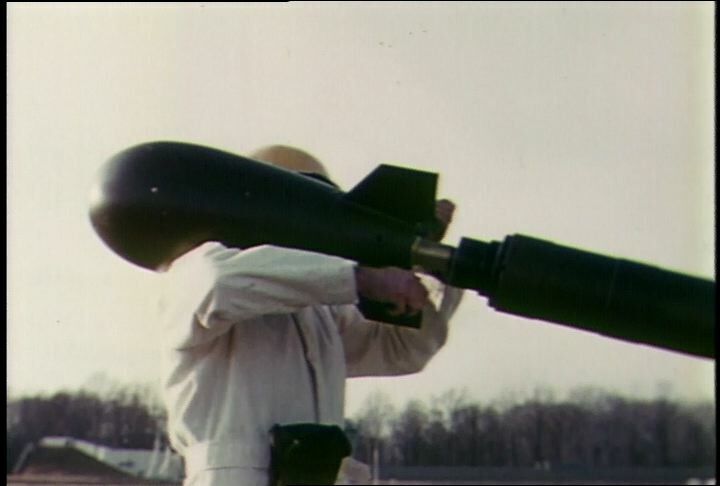 Footage of officers setting up and demonstrating the Davy Crockett missile. Chicago: “War and Peace in the Nuclear Age; Education of Robert McNamara, The; Davy Crockett Missile Demo,” 01/01/1961, WGBH Media Library & Archives, accessed April 23, 2019, http://openvault.wgbh.org/catalog/V_A81D9E1B1EC448BDACD06E3AA0ADA1E7. MLA: “War and Peace in the Nuclear Age; Education of Robert McNamara, The; Davy Crockett Missile Demo.” 01/01/1961. WGBH Media Library & Archives. Web. April 23, 2019. <http://openvault.wgbh.org/catalog/V_A81D9E1B1EC448BDACD06E3AA0ADA1E7>.